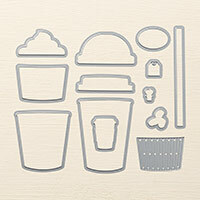 Coffee Cafe Photopolymer Stamp Set | Coffee Stamps | Stampin Up! Some people firmly believe that coffee is life. And whether that's you or not, you certainly know someone who feels that way. You should probably get a cup of coffee (or water if that's your thing), buy this peppy set, and start creating.